Italy has 20 regions, and each region has its own traditional food which is well known in the world..Italian food does not consist of only pizza and spaghetti, and the menu is as varied as the Italian regions. But There is much more to the world of Italian cooking. The culinary history of Italy established a reputation more than 2000 years ago. The significance of this culture has been captured in the only surviving cookbook (Apicius)which dates back to the first century BC. Over the years, Italian cuisine has greatly envolved in part beacuse of wealth of outside influences: ancient Greek cookery and the North African influences. The north developed Tuscan beef, while the truffles where vey popular in Marches. Provolone and mozzarella cheeses developed in the South. Diverse types of bread , variations in pasta and vaying food preparation techniques also differed according to region. Milan is known for their risotto, while Bologna has a deep history regarding tortellini, and Naples is famous for their Mozzarella di Bufala. Today the differences in Italian cooking still show through in the distinctions between the north and the south. Each region still carries their own traditions in cooking that reflects deep history and culture with a never ending supply of main courses, appetizers, and desserts that leaves you wanting more. 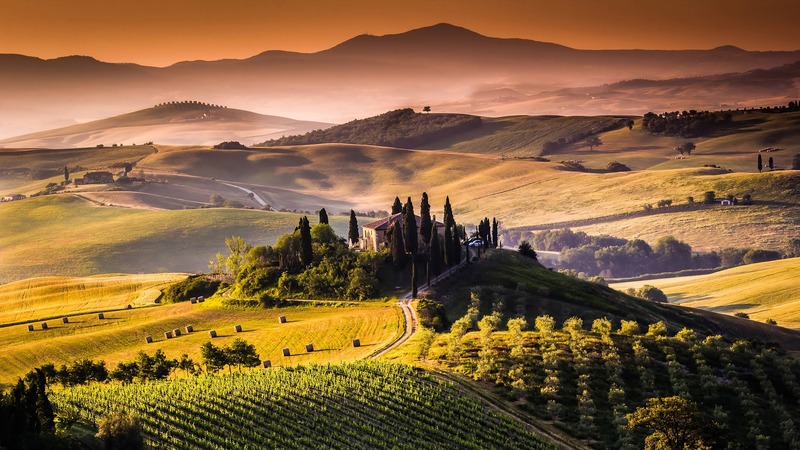 Italy is one of the most diverse wine making countries in the world.Grapes were so easily cultivated they named the country “Oenotria” meaning the land of wine. Italy continued to refine the techniques throughout the Middle ages firmly planting an international reputation for making a wide variety of excellent wines. Wine making occurs in all twenty regions of Italy and follows the European system of laws based on very specific geographical areas, grape varietals, aging requirements and other wine making quality controls.The depth and breadth of Italian wine comprises everything from the very dry to the ultra-sweet, red, white, rose, sparkling and fortified. Today, these selected wines are more varied and more popular than ever. Italy plants hundreds of varietals—many of which only grow in their country. An amazing range of red, white and sparkling wines made in every style (from traditional to ultra-modern) please critics, collectors, and consumers throughout the world. Italy’s wine future is just as bright as its legendary past.